← September Daring Cooks: Lookit me, I’m cooking vegan! I’ve been trying to figure out how to get started here for the last week. I mean, I guess its like any new journey – that first step is the hardest. 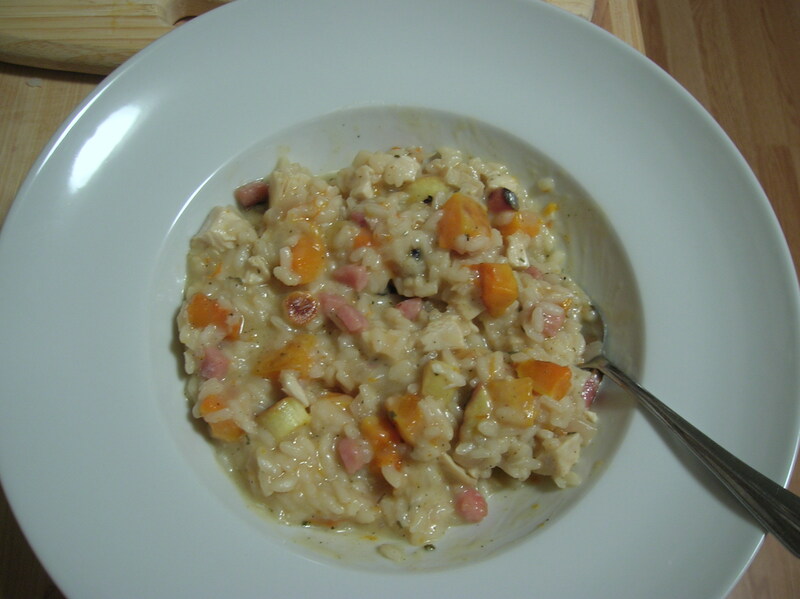 So I went clicking through my old blog with a half-formed idea of finding a way to export all the old posts and repost them here as archives, and ended up stumbling on one of my favorite recipes for Butternut Squash Risotto. As luck would have it, last night was a fend-for-yourself night for dinner, and we just happened to have a hunk of butternut squash kicking around the fridge without a purpose. So, guess what I made? 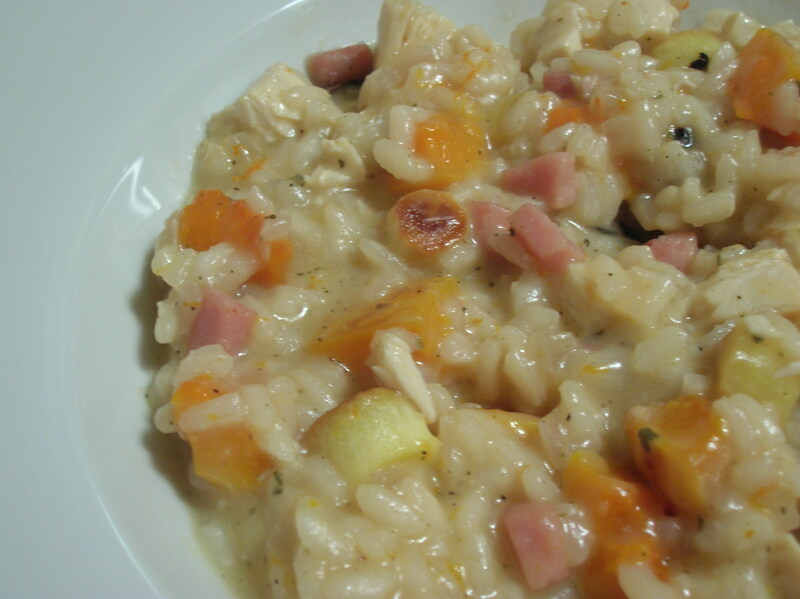 The original recipe for this risotto was pretty straightforward: roasted, sage-scented chunks of butternut squash stirred into creamy parmesan-laced risotto and topped with crunchy bits of pancetta. And it was delicious. In fact, it was one of the best things ever to come out of my kitchen. But now its two years later and, well, I can do better. For last night’s version, I swapped the pancetta for a slice of Justin’s home-cured Canadian bacon. (The LAST slice, to be specific, which is a tragedy. Thankfully it is a short-lived one, however, as he’s making more this weekend. Perhaps I feel another post coming on…) I punched up the vegetable content by tossing a diced parsnip onto the roasting pan along with the chunks of squash, and chopped up the last little bit of turkey meat leftover from Thanksgiving to add in at the end. And finally, just because I could, I stirred in a heavy tablespoon of mascarpone cheese just before serving. Totally unnecessary, but it was waiting around in the fridge for the perfect dish and I figured this was a good a time as any to be decadent. The end result is a risotto that stands head and shoulders above my last version Creamy, smokey, hearty and salty-sweet, with tender roasted vegetables and meaty hunks of turkey, I can’t imagine a more comforting meal to end a long, cold, wet December day. Its also a much more interesting way to use up some Thanksgiving leftovers than just making ANOTHER sandwich. And I mean, I like sandwiches, and I like Thanksgiving leftover sandwiches, but sometimes you’ve just gotta mix it up. The light wasn't quite right for this super-close-up, but I had to try anyway. While the vegetables roast, pour the chicken broth or stock into a saucepan and place over medium heat.When it reaches a simmer, turn the heat down to low and hold it there. You’ll need to keep it warm while you start the risotto. While the broth is heating, add the remaining 1 tbsp olive oil to another, larger saucepan and place over medium-high heat until it begins to shimmer. Add the Canadian bacon and sautee until it begins to crisp up, then add the onions and garlic and cook until the onions begin to turn translucent, stirring often to avoid overbrowning. Now add the rice and stir to coat each little grain with the residual fat in the pan. Cook this way for 2-3 minutes, or until the edges of the rice grains begin to look translucent. Add the lemon juice/red wine vinegar mixture and the remaining dry sage and stir with a wooden spoon to deglaze any little bits that may have stuck to the bottom of the pan during the dry-cooking step, and cook until the liquid is almost completely absorbed. Turn the heat down to low and add enough of the hot broth to just barely cover the rice in the pan, probably about half a cup or so. Stir the mixture occasionally to keep things from sticking and to agitate the grains into slowly releasing their starches into the liquid. When the liquid is almost entirely absorbed (I check this by dragging my wooden spoon along the bottom of the pan – if it leaves a clear trail behind that does not automatically fill back up with liquid, its ready) add more broth, again just enough to cover the rice. Keep repeating this process until you’ve used up all the broth OR until the rice is tender (I like mine just a hair past al dente) and suspended in a thick, creamy, starchy liquid. It should not be soupy or dry, but somewhere in between. When adding the last portion of broth to the rice, you should also add your diced turkey and the roasted squash and parsnips and stir them in gently so that they don’t fall apart or turn to mush (soft roasted squash tends to do that). When the rice has reached your desired level of doneness, remove the pan from the heat and stir in the parmesan and mascarpone cheeses. Taste for seasoning and add salt & black pepper to taste – I happen to think that a heavy hand with the black pepper is appropriate here. To serve, spoon into wide, shallow bowls and top with a bit more freshly-grated parmesan and freshly-ground black pepper. A handful of toasted walnuts would probably unnecessarily guild the lily, and I fully intend to try it the next time I make this. This entry was posted in Food, Drinks and Cooking and tagged Uncategorized. Bookmark the permalink.